Make a statement with this beautiful hand forged sterling silver 4-sided bar necklace. I hand cut and finish this piece to order, finishing it with a brilliant shine. The bar measures about 2" long. I can make the piece shorter or longer if need be, just send me a message for a quote. I can stamp text on all four sides of this piece, up to 25 characters per side. The finished pendant hangs on a beautiful 20" sterling silver satellite chain necklace. When ordering, you can leave what you'd like stamped each side in the notes on the checkout screen. You can copy and paste the text below then fill in with the text you'd like stamped, up to 25 characters per side. Please specify stamping for all four sides as follows, noting that sides one and three are opposite of each other, as are sides 2 and 4. Sides one and three will have the hole punched at the top, sides 2 and 4 are solid. If you'd like coordinates, I can look them up. Just provide me with the location. Your necklace will arrive nicely packaged and ready to give as a gift. This piece is hand stamped by me in my home studio. Although your piece will not look exactly the same as the one pictured, I promise it will be just as lovely. Every letter may not be perfectly aligned, but this is part of the charm of a hand stamped piece and should not be considered a defect. Your piece will be yours and only yours...not another one like it! I welcome you to browse my shop for other great personalized jewelry and gifts! Your item will be wrapped in pretty tissue paper, tied with a length of baker's twine. Tissue paper and twine design may vary with season. Beautiful quality and workmanship. I was able to create a completely unique piece that has tremendous personal meaning and will be treasured. It's Beautiful!! Thank you she loves it! I accept payment via Paypal. If you don't have a Paypal account, don't be afraid to open one! Paypal does not share your payment information with me or any other party you purchase from using Paypal. Paypal offers many different ways to pay and a very safe, dependable method of payment when shopping online. You can also checkout via Paypal as a "guest", without opening an account. All purchases are final. Once your order is submitted, it cannot be canceled or changed, unless deemed appropriate by shop owner. The payment method "other" is strictly reserved for local purchases. If you choose this payment option and proceed to check out, your order will not be started on, reserved, or shipped until payment is received in full. If payment is not received within 24 hours of the time of purchase, the purchase will be canceled. Custom items will not be started on until payment is made in full. Items will not be reserved or shipped until payment is made in full. Returns or exchanges in the amount of the price of the item (less shipping) will be granted in cases of mistakes on my part or damage during shipping, You must contact me within 14 days of shipment (from me to you) for a refund or exchange to be considered. Replacements will be granted at shop owner's discretion WITHIN 14 DAYS of the day your received your item. If an item is lost in the mail, and proven to be non-delivered via Delivery Confirmation, I will happily replace the item at no cost to you. Refund or exchange will be granted once the original item is returned to me, packaged similarly to how you received it. Most items in my shop are made-to-order and lead times vary depending on current order volume. Custom items will be shipped upon completion. Please convo me for current turnaround time, or see my shop description directly under the shop's banner on the main shop page. If your package is returned to me due to an error in address on your part or if the package is refused at the address you provided (this happens a LOT with work addresses, so please be sure the package can be accepted at your workplace) and returned to me, I'm happy to ship the item out to an alternate address, AFTER you have paid the shipping fee again. I'll contact you with a Paypal invoice for shipping and will get the package right out to you once the invoice is paid. PLEASE be sure that the address you'd like the package shipped to is indicated in both Paypal and in the "shipped to" section at checkout. Please do not leave an alternate address in the "note to seller" portion as I use an automated program to print shipping labels. I am not responsible for missent packages if the correct shipping address is not indicated in those two places. Unless otherwise requested, all domestic orders will be shipped USPS First Class with Delivery Confirmation from Ohio, which takes 3-5 days for arrival within the United States. Priority mail is a great shipping option (2-3 days) and I can quickly upgrade the shipping price for a listing. Please contact me before purchase so I can upgrade the shipping option for you. I happily ship internationally! I love my international customers! The International shipping included in the listings is for first class. THE USPS DOES NOT QUOTE A DELIVERY ESTIMATE FOR FIRST CLASS INTERNATIONAL SHIPPING. It can take anywhere from 2-6 weeks to most locations worldwide. If you need a faster shipping option, please convo me for options. I take great care in shipping every item. To keep items clean, dry, and safe, they will be bagged, placed inside a cotton-lined gift box, then wrapped with bubble wrap. If the item is a gift, just remember that the item is in a small ziploc baggie within the box. You may want to take the item out of the bag before giving. I try to stay as "green" as possible when packaging items. I will never use unclean packing materials, I only re-use "like new" packing. However, your gift packaging is all brand new as is the envelope your item will arrive in. If you prefer brand new bubble wrap or packing, simply let me know at check out. 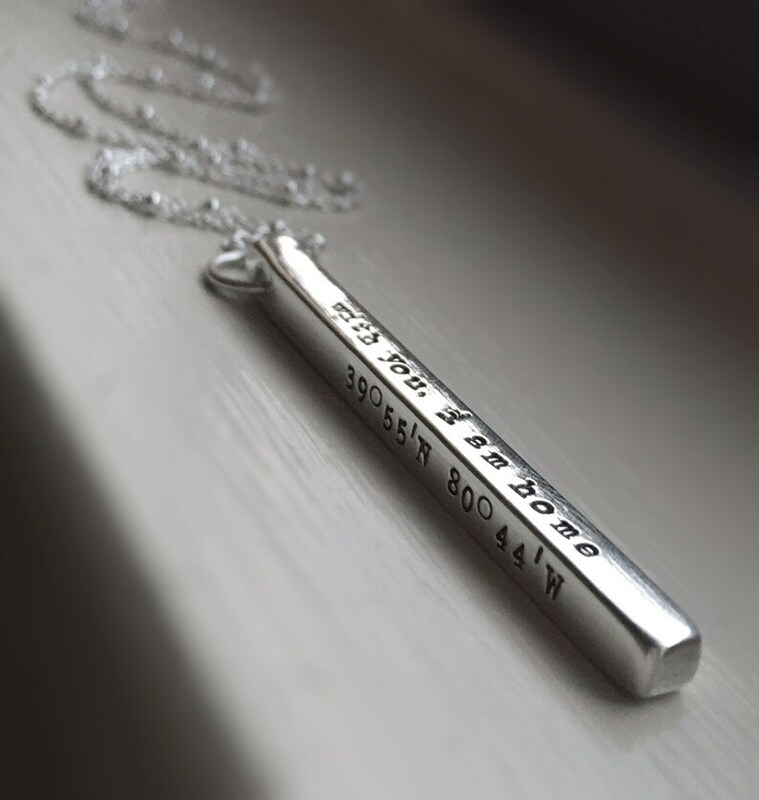 Hand stamped jewelry: Items are made upon order and in the order received. Please contact me for exact lead time as this changes due to order volume.